Mysterious, strong-minded, flirty, seductive . 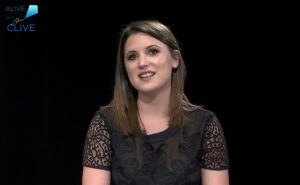 . .
With this combination of diverse attributes, plus a whole lot more, dynamic emerging singer-songwriter, Jodi Valentín [val-en-teen], brought her immense talent and enchanting repertoire of songs to Alive with Clive recently for two shows. Though she turned 23 in November last year, Jodi already has two decades worth of her passion and dedication to music invested in her craft, and she is now beautifully positioned to take her place among the greats like Ella Fitzgerald, Ariana Grande, Regina Spektor, Alicia Keys, Carrie Underwood, Adele, Christina Aguilera and Rihanna, in whose footsteps she has been following. As you start to listen to her songs, you’ll realize that while some of her influences are more noticeable, there are traces of so many others since she is constantly listening to a broad range of genres – from soulfully soothing R&B to hard-hitting hip-hop – and incorporating elements of each that inspire her into her songs. 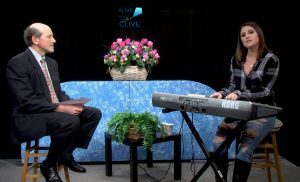 In her two shows on Alive with Clive, Jodi performed songs about relationships, ranging from the fantasy of being in the ultimate relationship (“With My Baby,” “The Man I Love” and “Stay The Night”) and the challenges of keeping the flames of love burning brightly (“What You Desire” and “For The Movies”) to the cold hard reality of being in a relationship that needs to be terminated (“The Radio” and “Running”). And she also sang “Changes” – an inspiring song about gaining wisdom from experiences in life on the path to self-acceptance and self-loving. If you like to discover, connect with and be inspired by today’s top singer-songwriters, you’ll definitely enjoy getting to know Jodi Valentín on these two shows! P.S. If you want to see Jodi Valentín perform live, she has a show at Rockwood Music Hall, Stage 1, on Saturday, July 1, 2017, at 7 p.m.